Training Material for Managing Difficult Conversations is designed for trainers to develop supervisors’ and managers’ abilities when dealing with tough topics. Teach your management how to establish positive intent, prepare their “toolkit” for successful conversations, staying safe and much more. Seeing is Believing This sample manual to teach Managing Difficult Conversations is in MS Word format. There are times in the workplace when managers have to deal with difficult people and tough topics and manage difficult situations. It is not something we want to do, but is something we need to be prepared for. Knowing how to properly deal with difficult situations is extremely important, because, if mishandled, it could end badly. This could be stressful, increase workplace violence or even be viewed as bullying employees. Don’t let difficult situations get the best of you, start managing properly! 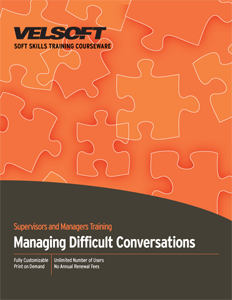 Managing Difficult Conversations Training Material is designed to prepare supervisors’ and managers’ communication skills and people management abilities. Velsoft training material is completely customizable to meet the various styles of trainers around the world. Rebrand to make our material your own and enter the classroom with confidence for a training session that will leave them raving for more! Interested in offering something other than instructor-led training? Managing difficult conversations training is available as eLearning or a blended-learning mix of classroom and online learning environments. Want to see how the course is laid out? Check out the course outline for managing difficult conversations!